The Recylex annual report 2016 is available in English and French and can be downloaded at the Recylex Group Website (www.recylex.fr). The Qatalum aluminium plant is working to solve outbound logistical challenges arising from the uncertain situation in the Middle-East after Saudi Arabia, UAE, Bahrain and Egypt cut off transportation links and severed diplomatic ties with Qatar. Qatalum is a joint venture between Hydro and Qatar Petroleum, and is producing more than 600,000 tonnes per year of value-add primary aluminum to customers in Asia, Europe and the U.S.
With effect of 01/01/2017, BAGR Berliner Aluminiumwerk GmbH acquired 50% of the shares of Stockach Aluminium GmbH from SSVP III, a Private Equity Fund. Both companies produce rolling slabs made from secondary aluminium. In November 2016 Eldan Recycling A/S successfully installed and started up an expansion of an Eldan tyre recycling plant at Italian customer GATIM. The original Eldan tyre recycling plant, supplied in 2001, will after the expansion produce high quality rubber granulate with 99.9% purity at more than 3.000 kg/production hour (referred to tyres input). The expansion involves an additional granulator and classifier as well as a tumble back feeder upstream the existing Rasper. Automotive recycling specialist Seda has opened its Turkey branch. Sims Metal Management has announced the sale of two metals recycling facilities in Detroit and Toledo that is effective as of 16 September 2016. As early as September 1, Swiss Vosop AG upped their shares in the Soex textile marketing company. Kent-based resource management and recycling specialist Countrystyle Recycling has invested approximately 325.00 Euro in a new IT system from AMCS. Initiated by Caterpillar, the company and Wacker Neuson have agreed to end their strategic alliance as of May 31, 2018. Caterpillar plans to manufacture and market its own mini hydraulic excavators in future. Professor Nickolas John Themelis received the CEWEP Phoenix Award for his outstanding contributions to the Waste-to-Energy sector during a Phoenix Award Ceremony held on 16th June 2016 in Rotterdam, the Netherlands. CEPI (Confederation of European Paper Industries) has announced the appointment of Sylvain Lhôte as its new Director General. As of 5 September 2016, Lhôte will take over from the current Acting Director General, Jori Ringman. The Tetraphos process by Remondis that recovers phosphoric acid from sewage sludge age has been named the winner of the Greentec award for recycling & resources. Rema Tip Top, a globally operating system provider of services and products in the field of conveying and treatment technology as well as in the automotive sector, has acquired a majority interest in the Australian company Convatech. Joest presents new Vibrating Air Separator at upcoming IFAT. 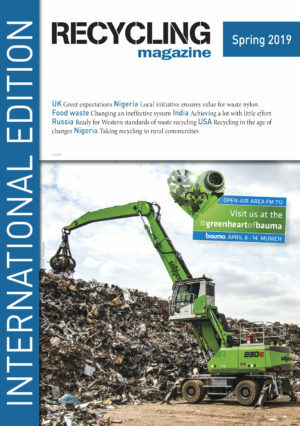 The newly developed machine combines two techniques – air and vibration – and is particularly suitable for materials such as ASR, tires, e-scrap, construction waste or household and commercial waste. The Recylex Group has announced a change to its 2016 financial agenda, postponing to a later date the publication of its full-year 2015 results and thus also the date of its Annual Shareholders’ Meeting. Upstate Shredding – Weitsman Recycling has hired Matt Schroth as Vice President of Commercial and Expansion. Schroth will focus his efforts on expanding the growing company in various markets. On March 10th, Ljubljana, the capital of Slovenia, has formally turned into Europe’s Green Capital 2016, the EU title it was awarded for its sustainable development over the past ten years. On 16.02.2016, the European Commission published its Communication on an EU Strategy on Heating and Cooling. ESWET welcomes this Communication and the accompanying documents, such as the Staff Working Document.